The Poco F1 and Mi Home Security camera will be up for grabs for just Re 1 during Xiaomi’s ongoing Diwali sale. Here’s how and when you can grab these steal deals. Xiaomi’s ‘Diwali With Mi’ Sale starts today, October 23 and will go on till Oct 25. Each day, Xiaomi will be offering Re 1 steal deals on its most popular products and given that today is sale day 1, Xiaomi will be putting up two of its newest devices up for grabs for just a buck. The Poco F1 budget flagship with Snapdragon 845 and the Xiaomi Mi Home Security Camera 360 will be up for grabs at 4PM today. The Poco F1 with 6GB RAM and 128GB storage will see its price drop from Rs 23,999 to Re 1, while the Mi Home Security Camera will also see a price drop from Rs 2,699 to Re 1. 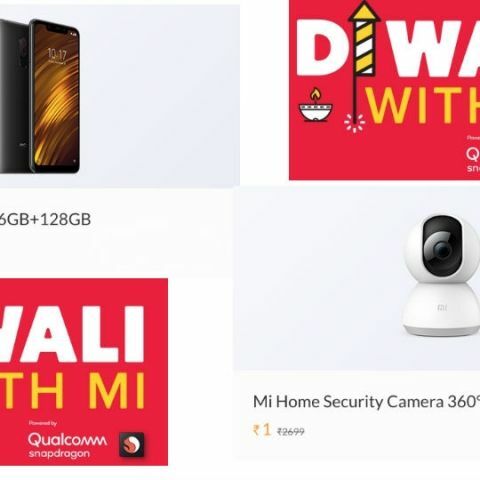 To grab these deals, you need to keep your trigger fingers ready and be logged into your account on Mi.com before 4PM. The deals will get unlocked right on time and it’s your luck if you manage to complete the transaction as the devices will be in high demand thanks to their almost free price tags. Similar Re 1 flash sales will also take place on Oct 24 and Oct 25 at 4PM, with devices like the Mi Compact Bluetooth Speaker, Redmi Note 5 Pro, Mi A2 and Mi LED TV 4A Pro up for the taking. Alongside Re 1 flash sales, Xiaomi is also offering Small = Big bundles of devices at very affordable prices. For instance, today at 6PM, the Redmi 6A + 10000mAh Mi Power Bank 2i can be purchased together for Rs 699. Similarly, tomorrow i.e. Oct 24, buyers can gram the Poco F1 and the Mi Home Security Camera 360 together for Rs 2,699. Coming to other offers and price drops, the Diwali With Mi Sale will see the Redmi Note 5 Pro shed Rs 2,000 off its original prices. The smartphone will be available for Rs 12,999 and Rs 14,999 for 4GB+64GB and 6GB+64GB variants, respectively. The Mi LED Smart TV 4A (43) which will be available for Rs 21,999, down from its original price of 22,999. The Redmi Y2 (4GB+64GB) will be available for Rs 10,999, down from Rs 12,999 and the Mi A2 will see a price drop of Rs 2,000, making it available at Rs 14,999. You can check out more offers on Xiaomi’s Diwali With Mi sale here. what is the next below 5000 range with 1 gb and dual camera phone or tab???? ?